There is a little more garden care to be done after getting your flowers and plants in the ground. Using the additional information found below (some that also includes time-saving tips), these additional gardening tasks can be quick 'n easy too. This additional care and light maintenance will also insure a long healthy season of bloom throughout your gardening areas. Ok, so you've created some beds by beautifully combining color in your garden and you've put together some well blended combinations. You bought and brought home various sizes of potted easy care flowers and plants. You've prepared their garden beds well and holes were dug. Everything is now in the ground. "What could be left to do," you ask? Mulching helps to keep your soil cool, retain moisture and control/prevent weeds in your beautiful garden areas. 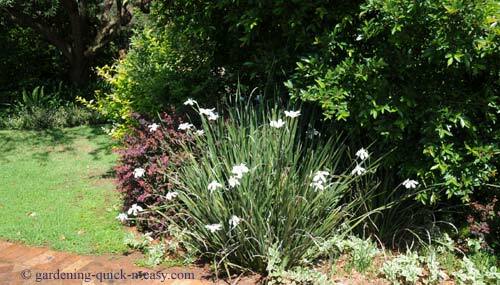 Weeding is thought to be such a chore when caring for your garden; however, with this time-saving garden tip, even weeding your garden can be quick 'n easy. Watering your garden after your flowers and plants are in the ground in the most advantageous way will help them to flourish and stay fresh and healthy looking for longer periods of time during bloom season. 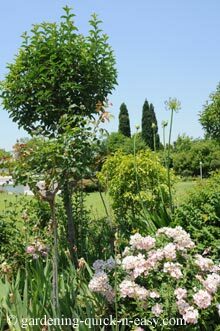 Plant Support or Staking may be necessary if you live in a very windy area or if you've planted any of the taller flower types available. Fertilizing provides a way of adding, improving or restoring balance to a lack of nutrients in your soil. Deadheading your flowers will keep your garden areas looking more attractive and prolong the blooming season for many of your flowers. Plant Division will help your flowers and plants when they overgrow their original areas ... remember to share extra with other gardening friends! Wintering your garden area helps to protect your flowers and plants so they can rest and prepare for the next growing season. Adding Compost in early spring and again in late fall by spreading a 1" layer of organic material over all of your garden areas must be the #1 garden care task. No need to dig it into your soil as the worms will take care of doing that for you. Note: We'd love you to send us your favorite garden pics to feature on our new pages! Just Contact Us and we'll send you an email address that can accommodate your photographs.